The ACE CLASS: ACTIVATE. CULTIVATE. EMPOWER. How often can those words be used to describe a company in today’s fast-paced, self-focused, and oftentimes inauthentic, world? It is this mission for authentic, meaningful connection that makes the media and events company such a unique sponsor of this year’s festival. My interview with Ace’s own Brand and Marketing Manager Kayla was nothing short of refreshing; It is their hope to continue to “build community and to touch as many women as possible,” which means we will only be seeing more of Ace Class here in Saskatoon. 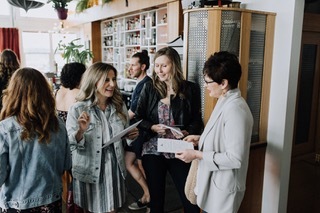 The company first came to my attention when a former employer of mine was featured at one of the company’s signature events, Babes Who Brunch, here in my hometown of Saskatoon. If you’re like I was pre-interview, and Babes Who Brunch registers as nothing more than a catchy phrase on a ‘Burnette’ label sweater, let me help you out. “Babes Who Brunch exudes all of the company’s, pillars in all of their glory. The event works to strike up meaningful conversations and build deeper connections in a room full of women of all walks of life. At Babes Who Brunch, they bring in a local keynote speaker to lead with vulnerability in telling their story,” and it was “from the magic of this event, the magic of bringing women together” that inspired the creation of Ace Class. You cannot give from what you do not yourself have—self-care is so important, what a needed reminder. THIS WEEKEND!! Join us October 20 & 21 2018 and experience Saskatchewan and Canadian fashion!